The William Hill online betting service is one that punters trust, thanks to the company’s association with the British high street. They are a long-standing bookmaker, and that certainly helps to gain them new customers. The service they offer, as you would expect from a bookmaker that has so much experience, is full of both quality and quantity. Alongside their sportsbook, William Hill also offer a casino although it is their sportsbook that is certainly the biggest part of their service. Here you will find events from all over the world, covering a wide range of sports. The William Hill welcome offer will allow you dive into the sports you like on their website, picking out the best bets. There are two sports that are covered in detail on their website, and they are horse racing and football. The horse racing section of the website will give you various ways to place a wager on the sport, and what allows them to stand out from the crowd is their coverage of racing from all over the world, something which few can compete with. 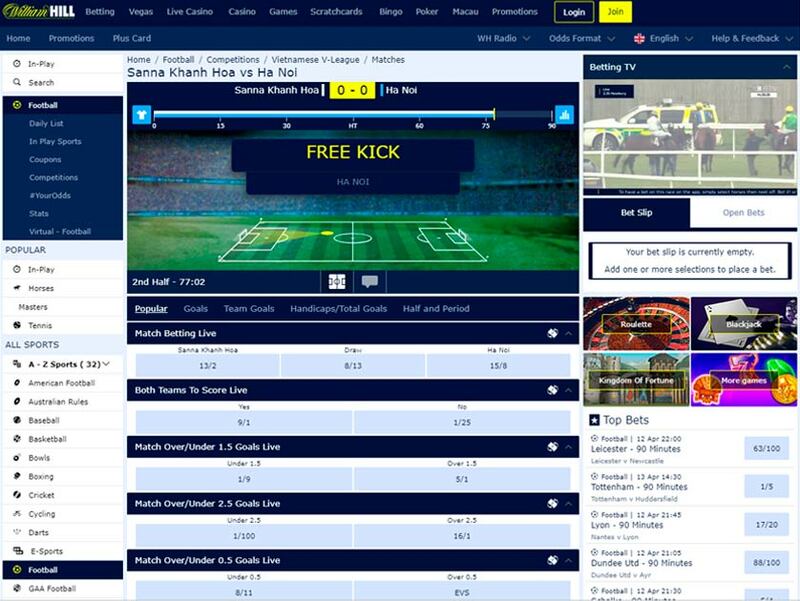 The William Hill football betting service is the same and as soon as you log onto the site and head to the football section you will find a variety of games and leagues covered. Whether you are looking for a goal scorer bet in the UK, or you would like a bet on the handicap in South America, you will find it all here. If you are looking for a bookmaker where you can place your football bets, then few offer greater detail in their service than William Hill. Those who are looking to sign up to a new account should know about their fantastic free bet offer. The William Hill sign-up offer gives customers the chance to earn £30 in free bets. To do this, you need to open a new account with them and place a £10 bet of your own. When you have completed this you will be given 3 x £100 free bets to use on any sports market you wish. 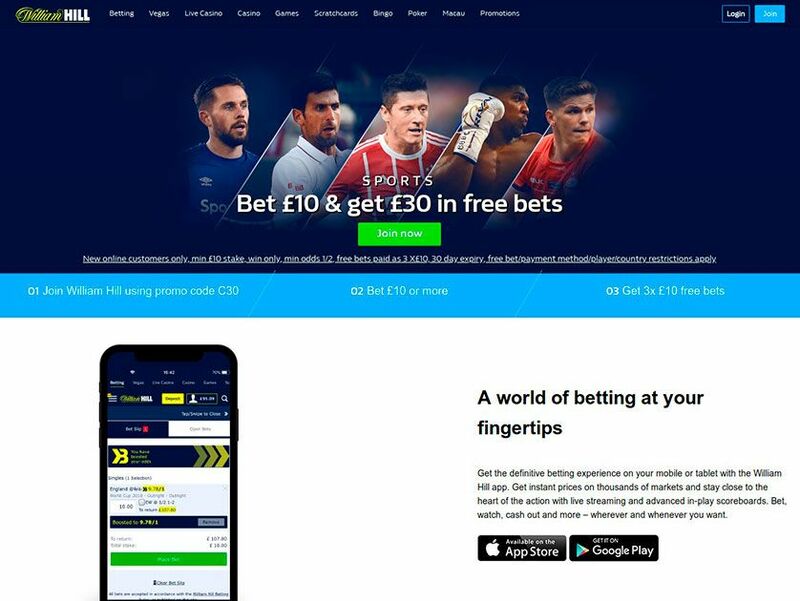 This means that after spending your initial £10 with your new bookmaker, you have three bets to the same value that you can use without spending your own money, giving you a total of four chances to win, while you only pay for one of those. This is a great offer that new customers to should take advantage of. A key part of any bookmaking service is allowing your punters the chance to bet on the go. This is something that a lot of people use, and even when a computer is nearby, it can often be easier and quicker to bet using an app rather than turning on and loading up the computer. The importance of a top quality app has increased significantly in recent years, and bookmakers are and putting a lot more effort and money into creating the very best app possible for their players. Just like many other bookmakers, William Hill allows you to bet on the go. The William Hill mobile app is available for download on most devices. With this app on your phone, whether it is Android or iOS app, you can place a wager anywhere you like, giving you the ultimate freedom when placing your bets. The app has been designed with the punter in mind, and with similar menus to what you will find on the website, you will quickly be able to find your way around and place the bets you need. This means if you are out and short of time before an event starts, you will still be able to get your bet on before kick-off. The William Hill customer service team is on hand to help you out 24 hours a day, seven days a week. They are contactable in three different ways, with a live chat service, phone line and email support all waiting for you. When you bet on the William Hill sportsbook, the hope is that you don’t have any problems but it is always nice to know people will be there to help if you need them. You can make a William Hill deposit in many ways thanks to the extensive payment methods they accept. From depositing with bank cards to using a variety of e-wallet payments including Skrill, Paypal and Neteller much more, there will be an option for you to use. The William Hill online bookmaker service allows you to take control and deposit how you want to, which is great for those punters who only have one or two payment methods available to them. When it comes to withdrawal time, these are very fast, but they do vary depending on the method you use. Those using a bank card will see their payment back in 1-3 days, while Paypal has a withdrawal time of just one day, which is great for users who deposit and withdraw through them. 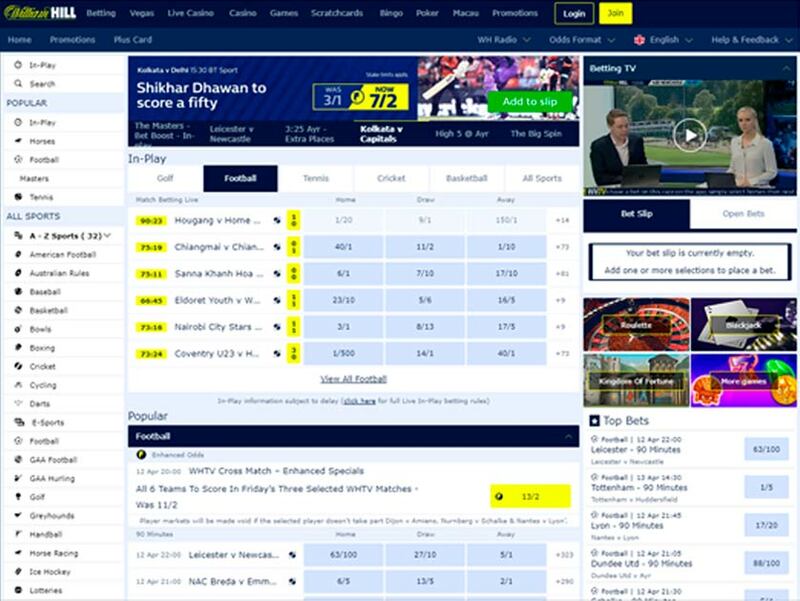 If you are looking to open a new account with William Hill, then here are the advantages to choosing them as your new bookmaker.